Housed in a restored building originally built in 1888, The Kothi Heritage has beautiful architectural details. Located 2.5 miles from Jodhpur Domestic Airport, it offers lovely courtyards and Ayurvedic massages. 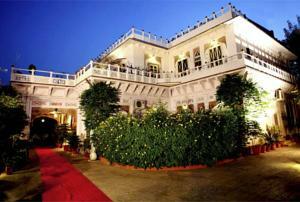 The Kothi Heritage is 2 miles from Jodhpur Train station. Jodhpur Bus Depot and Mehrangarh Fort are both 3 miles away. Featuring wooden furniture, air conditioned rooms come with a 30-inch TV and tea/coffee making facilities. Private bathrooms provide a hot and cold shower and a hairdryer. Guests can go on a village safari, or enjoy reading in the library or the grounds. The hotel offers a 24-hour front desk and a shopping arcade. Services include travel assistance and car rental. Folk musicians accompany dinners at Heritage Royal Dining hall. Indian and continental meals are served in the garden and rooftop restaurants. Rooms: Hotel Rooms: 12, Hotel Chain: Heritage Hotels. Free! All children under 6 years stay free of charge when using existing beds. One older child or adult is charged INR 650 per night and person in an extra bed. Maximum capacity of extra beds in a room is 2. There is baby beds in a room is 0 capacity for cots in the room. Any type of extra bed or crib is upon request and needs to be confirmed by the hotel. Supplements will not be calculated automatically in the total costs and have to be paid separately in the hotel.